"I knew my limits as a footballer." 200 km per hour on Sunday." Former AC Milan, Atletico Madrid, Parma and Italian national team manager, Arrigo Sacchi, pens his much-anticipated autobiography as told to journalist, Guido Conti. This article will focus on excerpts to complement my book review that was done in the past. 1. His Philosophy in a Nutshell. "I never have forgotten my origins in the factory. That experience molded me not only in character but also in professionalism thanks to the sense of obligation that I inherited from my father. Without, however, losing sight of the beauty to follow your own dreams. Today, I look to transmit all of this to managers, making them the recipients of my lengthy instructional experience. Recounting how I psychologically managed the changing room with so many different personalities along with relationships with the public, media, ownership and other directors of a club." --- Arrigo Sacchi, "Calcio totale: La mia vita raccontata a Guido Conti," (Total Football: My Life as Told to Guido Conti), Chapter 17, pages 272 to 273, published by Libri Mondadori with a list price of EUR 15,30. Arrigo Sacchi. The mere name conjures up an image of a bald-headed mad football scientist who revolutionized Italian football with his obsessive attention to detail, introduction of zonal marking, defensive pressing, use of the offside's trap, other new ideas, a new lexicon ("restarts, preventive positioning, preventive marking" on page 271) and an overall anti-Catenaccio attitude. Of all the most outlandish football predictions, who would have bet that an outsider such as Sacchi would produce one of the best clubs sides of all-time during his tenure at AC Milan? Mister Sacchi won eight trophies in a four-year period. Sacchi believes in the collective over the individual and intriguingly, places talent at the end of his desired list of key traits in a player. Let's take a longer look at detailed excerpts from one of world football's leading managerial figures and thinkers about the game, Arrigo Sacchi. During his time with the Azzurri. "After seeing this Milan, football will not be the same again". His philosophy can be summed up as follows: Be the master (he used the Latin word dominus) of the play with a fine-tuned and synchronized collective over one-dimensional talented individual stars, velocity in execution, pressing, attack, intense preparation that mirrored match situations in training, concentration, no retreating, entertain, innovate and win deservedly. Sacchi also placed intelligence, ethics, morals and proper behavior as key factors in his system. He not only coached the player but also wanted to develop the man and was quick to exclude those who did not fit his vision. 2. Translated Excerpts by Steve Amoia of World Football Commentaries. 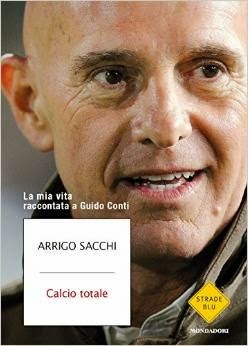 There are 17 chapters, a table of contents, along with a summary of Sacchi's coaching C.V. Each chapter has an introductory quote from a famous person. My favorites were "There is no art without obsession" by Cesare Pavese (Chapter 5), and "Don't try to be better than others. Try to be better than yourself" by William Faulkner (Chapter 9), respectively. "With the new ownership group, it was truly the end of a nightmare for the fans. (Silvio) Berlusconi gave guarantees of objectives, of economic security and above all, a new enthusiasm. In the first year, Berlusconi kept Nils Liedholm, but then he regretted it because he felt he had to make his own decision. He always had intuition in the discovery of men. Sacchi gave a scouting report on most of his Milan players similar to the one above. That is the best way I can describe these rare, candid and enlightening analyses from the perspective of a former manager. Chapter 17: "A Day Ahead." I was not financially compensated by the co-authors, publisher or any party who would benefit from a positive presentation and/or promotion of their work. All of the translated content, while done by me, is copyrighted (c) 2015 Arnoldo Mondadori Editore S.p.A., Milano. Steve Amoia is a freelance writer and translator from Washington, D.C. He is the publisher of World Football Commentaries since 2006 and The Soccer Translator from 2008 to 2015.